I was recently camping on the rock springs river run near Orlando, Florida and had the opportunity to take this image. The forest around the campsite was covered in webs made by some absolutely gorgeous spiders (the orb weaver here being no exception). Golden silk orb weavers are part of the genus "Nephila" which is Greek for "fond of spinning," which does a lot to explain the preponderance of webs all over the woods. 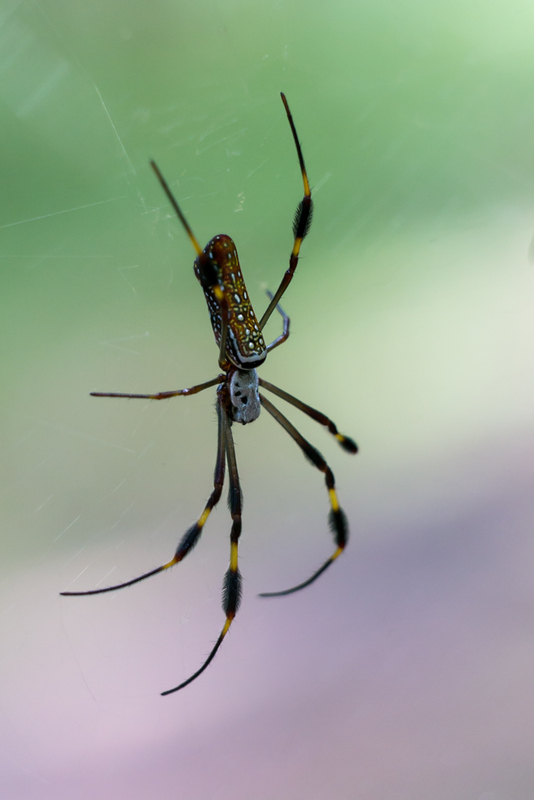 The genus "Nephila" is actually one of the oldest known genus of spiders with fossils dating back over 150 million years ago. The spider here is most definitely a female given her size. I chose to photograph her such that her web is barely visible to make look as if she's suspended in mid-air. In the background you can see the greens of the woods behind her along with the purple/browns of the forest floor.